I feel like Ellie Kime, aka The Wedding Enthusiast, is one of those industry peeps who's, quite rightly, on EVERYONE's radar. She only graduated from university last year (with a degree in Philosophy, no less) but, thanks to her incredible focus and boundless enthusiasm (well, come on, what else would you expect from a self-confessed enthusiast?! ), she's quickly become your go-to girl for all things Wedding. Whether you're a couple wanting some assistance with your Big Day planning (Ellie has an amazing eye for styling and a bulging contacts book, to boot!) or a wedding business in need of some extra marketing support, Ellie is 100% the woman you need in your life. I met Ellie properly when she gave a talk at Wedding Breakfast Club a couple of months ago and am pleased to say she's as warm and smiley and generous as she comes across on Instagram. She's one of those people who genuinely wants to see the people around her succeed and she's a big cheerleader for other small businesses and innovative brands trying to get ahead in the wedding industry. She got me hook, line and sinker - can you tell!? 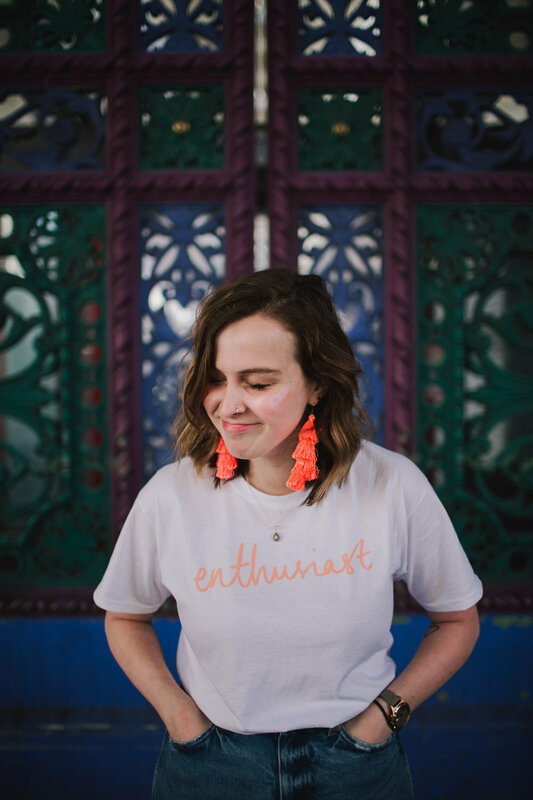 I cornered Ellie a couple of weeks ago for a chat about the importance of discovering your enthusiasm and being authentic in an age of 'alternative' weddings. I took a lot away from this so I hope you enjoy! Can you explain your alter-ego The Wedding Enthusiast and what it is your business offers? Contrived as this may sound, there is no alter ego. The Wedding Enthusiast is me. Hellooooo! By name and by nature, I bloody LOVE a wedding. I’m lucky enough to be of that age where I’ve grown up in a world where the view of work is shifting. I think the idea of a multi-faceted work schedule is much more accessible nowadays than it once was. My mum was, and still is, really interested in improving the education surrounding employment that’s available for young people - less 'if you do history you’re gonna be a teacher for the rest of your life' and more 'what sets your heart alight and how can you get paid to do that and serve a purpose?' which totally rubbed off on me. My “Thing” is enthusiasm - unabashed, limitless, oh-god-you-can’t-seriously-actually-be-this-keen-in-real-life enthusiasm. Couple that with a feisty (read, stubborn) attitude to do things my way - and here we are! I’ve already done some soul searching on the way (and that’s not a bad pun referring to a terrible choice of uni degree, Philosophy) and my business has changed over time as I have - for example, I offer business services now. The world is our oyster and we it’s shining pearl. We’ve gotta make the best of it. Atypical! Haha. Most of it is spent at my desk next to my giant “WORK HARD AND BE NICE” poster by Anthony Burrill. When I’m not gathering inspiration, making mood boards or finalising details for couples on my laptop, you can find me blogging on Rock n Roll Bride, Way Out Wedding and THE UN-WEDDING. I’m also part of the team that puts on A Most Curious Wedding Fair so there is a lot of glamorous emailing and planning to go with that. I do a lot of venue visits and meet-ups with people I love in the industry, as well as couples, which can be cake, coffee or cocktail-based, whichever their preference! I also live both my dream and my best life working for Vicky’s Donuts, meaning a couple of times a week I’m making sweet, doughy magic. In terms of working with couples on their big day, what kind of weddings do you love working on? The authentic ones with a focus on friends and family (or either, if you don’t have much or the other: no judgement.) Couples who just want to plan a massive party to celebrate with their loved ones are always the standout winners for me. Luckily they also tend to be the creative and uber cool ones, so that works out well. I also love couples who come with a brief that’s inspired by something a bit removed from the wedding world. Translating these things over is always loads of fun. What makes you different from other wedding planner-type peeps? In an industry where 'alternative' is now becoming the norm (and happily and deservedly so, it’s taken far too long), I like to think I stand out by being totally genuine and authentic. My business is me and I only do what I feel right. Anyone who knows me would say I’m pretty unique (whether positively or negatively is open to individual interpretation...) so I guess that’s what I’ve got up my sleeve. Also, I have a literal Guinness world record for eating cream tea, so that’s pretty standout. Useless, yes, But standout. Do you have any standout memories working in the wedding industry so far? Get yourself over to Ellie's shop and bag yourself one of her FAB Enthusiast t shirts! Tell me about your ENTHUSIASM movement and what you've got up your sleeve with that! Do you have one tip for couples planning their wedding?